I am pleased to welcome guest blogger, James M. Schmidt to Murder by Gaslight. James writes about the American Civil War is the author of several books, including Galveston and the Civil War: An Island City in the Maelstrom. An article of his was recently published in The New York Times for their “Disunion” series on the Civil War. 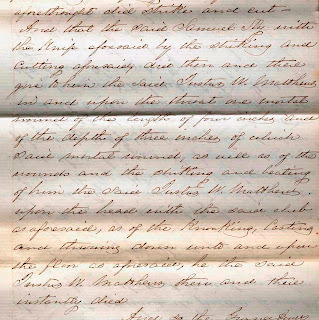 James also blogs about the Civil War from a medical point of view at Civil War Medicine (and Writing). The grim prose is actually only a hint of a week’s worth of violence and madness that began on Christmas Eve 1855 and took three innocent lives. It offers a trail of treasure in primary material and engaging stories for anyone who takes the time to investigate the tale. It also crosses multiple subjects of interest to people who enjoy studying the 1800s: cults, Spiritualism, mental illness, journalism, court proceedings, incarceration, class distinctions, and much more. The father of Hon. 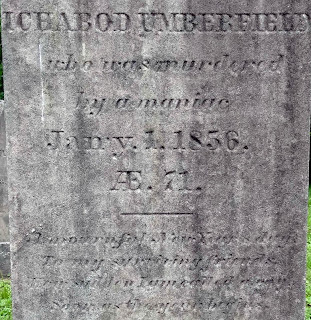 N. D. Sperry, Secretary of State, and a farmer, named Ichabod Umberfield, were cruelly and savagely killed by a lunatic named Charles Sanford, in the town of Woodbridge, on Tuesday… He seems to have accidently encountered Mr. Sperry, in his sleigh, about a half mile from the main road, on what is called the Shunpike, about 11 o'clock A. M.; to have made an assault on Mr. Sperry; dragged him from his sleigh … Mr. Sperry was struck first on the right temple with the head of the axe; then another blow just above the right ear, both of which produced fractures of the skull. He was then struck with the edge of the axe on the neck, the blow entering just under the chin, which it wounded and nearly severed his head from his body. Sanford was apparently driven mad by the murder of a relative a week earlier, and that is an even more interesting story! Apart from the grisly killings and bizarre backstory of the sect, which are interesting enough, this story has several other interesting angles. 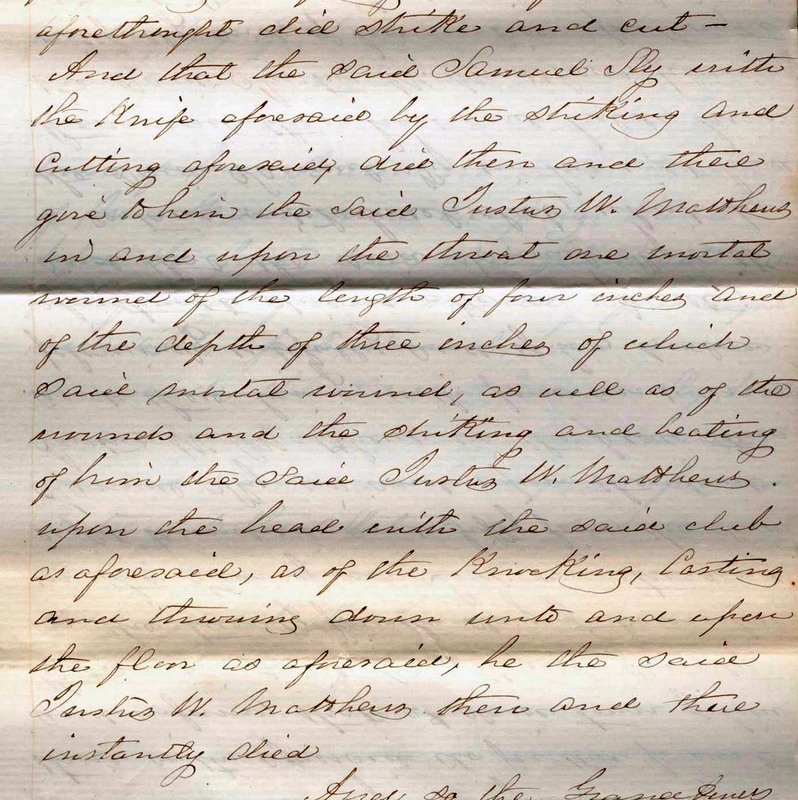 In terms of research, it was the first time I had actually found (with the help of archivists at the Connecticut State Library) and read handwritten court documents in my historical research, and I found them fascinating. The grand jury indictments carry a lot of legalese (advice: don’t start a drinking game over the word “aforesaid”…you’ll be smashed in just minutes) but also grim details of the murders, and one wonders how the good citizens absorbed the testimony. The Wakemanite murder story was carried in newspapers across the land. Indeed, such was the interest in the case that Horace Greeley’s famous New York Tribune detailed a reporter to the New Haven jail, and some of the most interesting information comes from these interviews published over the course of a month in the Tribune, and copied in other papers. This is all the more interesting, since the trials didn’t occur until April 1856. In one particularly creepy exchange, Mrs. Wakeman informed the reporter that he, too, was in danger of being possessed! Earl Wesley Fornell, The Unhappy Medium: Spiritualism and the Life of Margaret Fox (Austin: University of Texas Press, 1964). 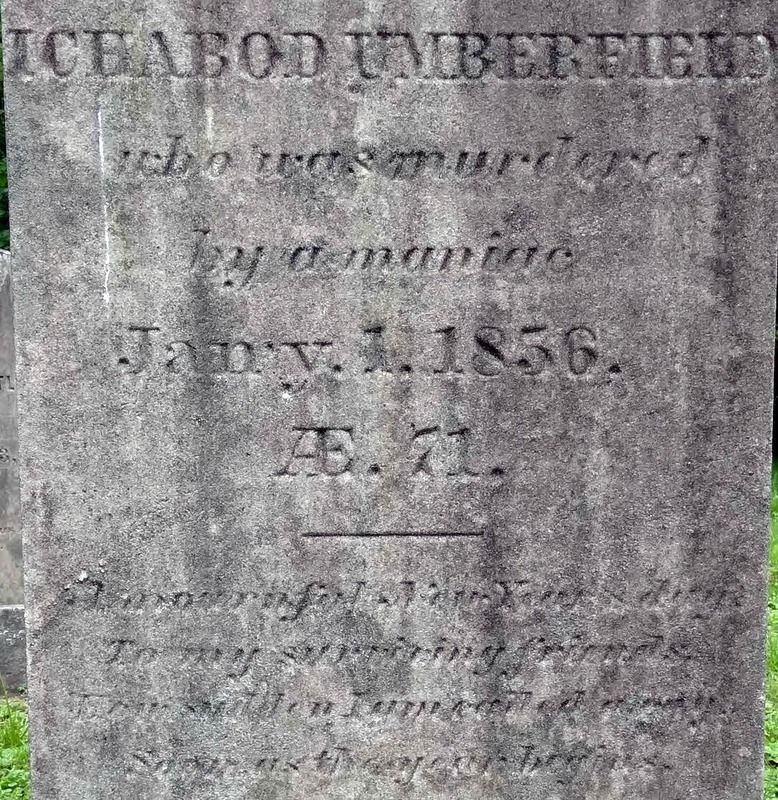 Barbara J. Mathews, “Welles Descendant Was First Victim of The Maniacal Ax Murderer of Woodbridge, New Year's Day, 1856,” Wellesprings, April 2004. Great history and murder mystery and weird psychological court happenings. All the makings of a super story. You cannot make up stuff like this.